Celebrate your style at Aloft Tempe, with views of Arizona State University and plenty of places to play! Sun Devil Stadium lures the football fans, while top golf, corporate offices, and easy breezy airport access make business travel a pleasure. Meet & mingle with friends at our w xyz(SM) bar, grab a sweet, savory, or healthy snack from re:fuel by Aloft(SM), our 24/7 pantry, or play in our re:mix(SM) lounge. Plus, you can always stay connected with complimentary hotel-wide wired and wireless Internet access! Breeze into one of our Aloft rooms, featuring our ultra-comfortable signature bed, an oversized showerhead, custom amenities by Bliss Spa, and more. Our plug & play connectivity station charges all your electronics and links to the 42 LCD TV to maximize work and play. Zipping into the Southwests Valley of the Sun on a business trip or carefree vacation? 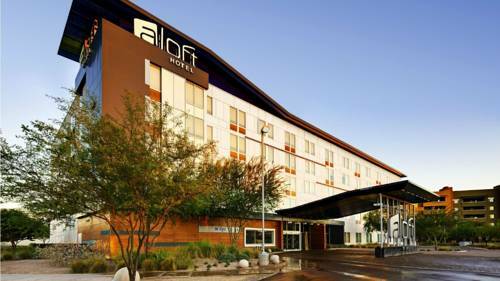 Aloft Tempe offers easy breezy access to the entire area but is light-years from all those other run-of-the-mill hotels. Abuzz with the energy of discovery and interaction, this bold new lodging alternative will surely inspire you to explore our namesake city and its scenic surroundings. Stay and play awhile! Youll discover one of Americas best recreation centers, on the outskirts of Phoenix and overlooking scenic Arizona State University. Breeze over to campus, where Sun Devil Stadium lures football fanatics and basketball and baseball buffs enjoy Wells Fargo Arena and Packard Stadium. Outdoor enthusiasts are moments from desert landscapes at Papago Park, aquatic activities at Tempe Beach Park, and loads of top-notch golf. Visiting for business? Headquarters of US Airways are just 5 minutes away, with many other area offices equally accessible. Need local tips? Check out the in-touch kiosks in our re:mix(SM) lounge, covering everything from airline phone numbers to after-dark hotspots. Then ease on down the road and experience the fun to be found around Phoenix. Clink! Meet, mix, and mingle over cocktails at our ever-abuzz, never-a-dull-moment w xyz bar. The fun flows freely with everything from pints to Pinot Noirs to specialty sippers, plus a snack-attack menu, mood music, and can t-miss events. Grab and go at re:fuel, our self-serve gourmet eatery full of mix-and-match meals, make-your-own cappuccinos, and more. Available 24-7 for the ultimate convenience, it s the perfect place to refuel when you need a quick pick-me-up! Natural erosion created this sandstone portal to tourism in scenic Papago Park.